My medical practice focuses on Primary Care Rheumatology and Internal Medicine, and Rheumatology Consultations. I have a special interest in patients with Fibromyalgia Syndrome and musculoskeletal pain, Systemic Lupus, Rheumatoid Arthritis, Gout and difficult to diagnose and treat Rheumatology and Internal Medicine patients. 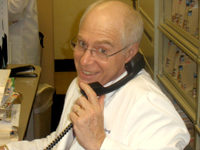 My practice approach offers comprehensive, patient friendly medical practice services. I really enjoy treating my patients with an emphasis on optimizing their health; which to me means minimizing disease and helping them reach their personal goals in life. I focus on preventive care to keep patients as healthy as possible. This approach over time has kept most of my patients out of the hospital and has helped them become as healthy as possible. I strive to give each patient the time and attention needed to assess and understand their medical issues, answer questions and determine a treatment plan that is individualized for them. Because of this approach, for some patients I am only their Rheumatologist and for some patients, their Internist as well. My Practice Manager can help you with making appointments, facilitating referrals to other specialists, radiology imaging, other medical tests, as well as, helping with your prescriptions, insurance questions and other practice concerns. Insurance Participation. My practice does not participate with health insurance plans, including Medicare. This allows me to spend extra time with you to provide thoughtful and comprehensive medical care. Payment for medical services is expected at the time of your visit. At the end of your visit, my staff will give you an itemized bill that you can submit to your insurance company for reimbursement. Any reimbursement of payments will be decided by your plan and sent directly to you. The office will submit your bill to Medicare as required by law. My fees for medical services provided to Medicare patients are determined by the Medicare regulations. A payment plan may be arranged on an individual basis if needed, just ask. Health insurance claim forms will be submitted by the practice for Concierge member patients. I received my medical degree from Albany Medical College, Albany, New York. I completed my Internal Medicine training at Long Island Jewish Medical Center, New Hyde Park, New York and my Rheumatology training at Mount Sinai Medical Center, NYC, New York. I am Board Certified in Rheumatology and Internal Medicine. I continue to work hard to stay current with the latest information in my field of medicine. I am an active medical staff member of Suburban Hospital, a Johns Hopkins Medical Center which is associated with NIH. I have been consistently named one of the top doctors in Washington DC as published in the Washingtonian Magazine. I am the Chairman of the Medical Advisory Committee of National Fibromyalgia Partnership, Inc., was the 2012 President of the DC Rheumatology Association and have served as President for the Jacobi Medical Society. My interest in chronic pain and Fibromyalgia Syndrome has been the focus of many lectures I’ve given to patients and doctors over the years. My Continuing Medical Education lecture “Managing Fibromyalgia: Advances and Future Direction” was presented it to physicians nationwide. My physician and patient resource article entitled, “Fibromyalgia, Documentation & Treatment” is posted on this web site, and it serves as a guide for primary care professionals treating patients with Fibromyalgia. You can print out this article and bring it to your primary care physician. I have been invited and honored to present Medical Grand Rounds at Suburban Hospital, National Rehabilitation Hospital, Sibley Hospital, Kaiser Permanente, Arlington Hospital and a Rheumatology Series of lectures at the George Washington University Hospital, some of these lectures are posted on the web site as well. I’m not afraid of difficult cases. I enjoy the challenges of complicated and difficult to diagnose medical cases. I like taking the pieces of your medical puzzle and making sense of it. I love what I do and I really enjoy my patients. Most of my patients have been with me for many years. I try to be available to my patients and to empower them to be part of the medical team.